coming to the Shark Tank Show! I know the Litenetic's is still a few weeks away before appearing on the Shark Tank, but this Christmas light product is to cool and something you probably wish you knew about before untangling your Christmas Lights for the last time. This really is one of those inventions where the light bulb goes off and makes you think "why didn't I think of that" when solving a very real problem that every single person deals with when stringing up Christmas lights. 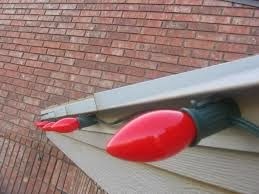 The inventor of the Litenetic's Magnetic Christmas Lights is Shawn Genenbacher from Lexington, Texas. Shawn got into the Magnetic Light Business over 4 years ago and already sold over 1,000,000 linear feet of the coolest and easiest way to hang Christmas Lights ever invented. According to Genenbacher's Shark Tank Audition Video, He will be seeking a $250,000.00 investment from the Sharks for a 30% equity stake in the magnetic Christmas Light Business. Shawn does mention he already has secured a utility patent and wants to get Lite-Netics into the big box offline retailers like Home Depot and Lowe's as well as Online at Amazon. By the looks of how Shawn decorated his vehicle for his Shark Tank audition tape, I can only imagine some of the new creativity folks will now create using magnetic Christmas lights that stick to any ferrous metals. The not so good news is Shawn Genenbacher doesn't look like he's opened up a FaceBook or Twitter account for the Litenetics Business that I could find. Just about every contestant seen on the Shark Tank has at least some sort of social networking exposure, but to have none in this day and age is quite rare. This might be explained in his audition video because he's looking to take his invention big time to the big box retailers, but how much "free exposure" is it costing this business not utilizing any of the free social network sites? People LOVE to share cool new products with their Friends which is and will always be the very best form of advertising money can't buy. It doesn't look like you can buy the Litenetic's magnetic light's at the big box retailers in time for this Christmas, but they do have a good selection available at Amazon starting with a 25' magnetic strip all the way up to a 500' roll. As you can imagine having individual magnets spaced out in one foot intervals will obviously add to the cost which is approx. $1 per foot in the larger rolls. But the time and convenience, not to mention the safety factor when using conventional Christmas Lights, makes the Litenetic Lights stand out way above even the closest competitor. With such a superior product and so many benefits from anything else on the market, you'd think the Shark's will be all over this one and gladly invest $250k for a piece of this business. On the other hand every one of the Shark Tank Investors knows the importance of social media and you would at least think they would help start building up a following this close to Show Time. The other concern is how much it costs for a strand of Litenetics Magnetic Christmas Lights. These certainly are not the cheapest Christmas lights on the market, but as with all new products the costs will come down as the Litnetic's Lights become more main stream. If you have ever in your entire life strung Traditional Christmas Lights while hanging over the roof or on a ladder trying to secure them, then it's easy to see the benefits using the Lite-Netic's Patented Christmas Lights for the safety reasons alone. Retail is a path to financial freedom , but it is an example of the 2 edged sword . The sales can be great , but the cost of handling the return merchandise can be an issue .